Make it easier to keep track of the people and companies you do business with. Record every sales prospect conversation through timeline discussion history. Communication is at the heart of each sales stage. My Field CRM records every step of the process from initial enquiry through to eventual sale, collecting vital sales statistics along the way. 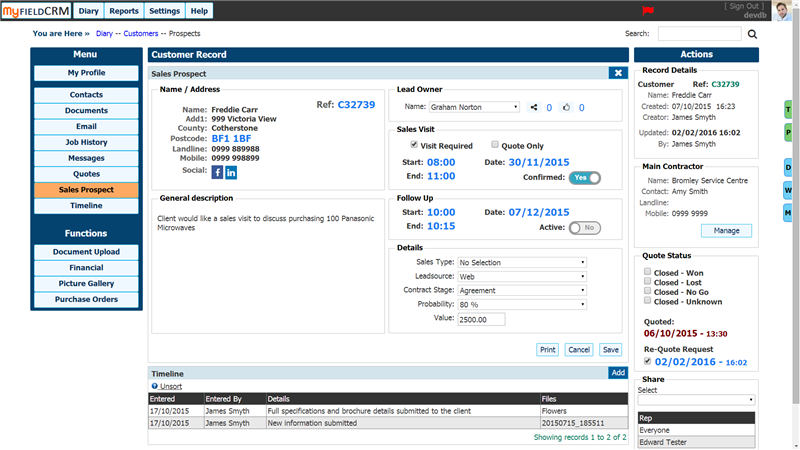 Book sales calls through your prospect record that will appear immediately on your appointment diary. Create timed reminders to follow up the discussion and produce quotations recording the current status showing sold/lost details. 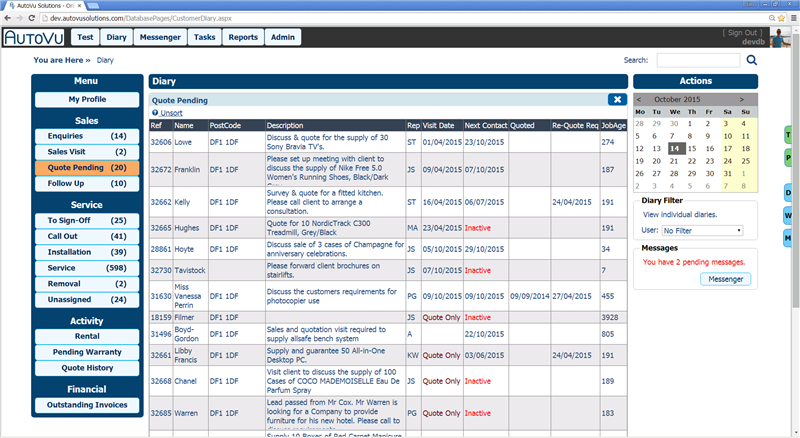 Create Quotations within the customer prospect record that can be emailed or printed. 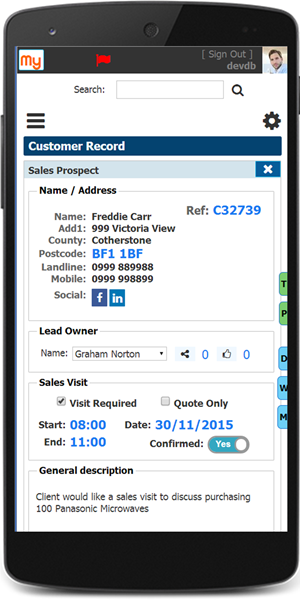 Lead generation and subsequent sales visits or sales meetings tracked with marketing automation through the My Field CRM prospect record. Use powerful marketing tools and view insights in to each lead as you progress through the sales pipeline. View potential leads and status within an easy to read list. 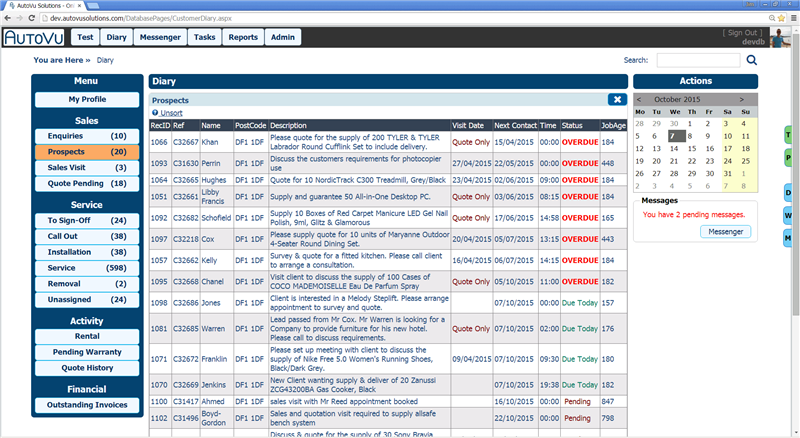 Follow up dates and sales visit times are easily viewed or sorted by clicking the column headings. Details include job age and descriptions. A concise list showing details of every outstanding prospect within your sales pipeline. Detailing call back status, sales visit dates and how many days the lead has been held within the sales cycle. Online HTML editor for preparation of quotations. Preview online including company stationary. Utilize mail merge hash tags to automatically include customer address details and references. Create PDF documents ready for printing or email.